The above-quoted 2009 speech – delivered before Fidesz’s (widely anticipated) landslide victory in 2010 – points to a key pivot from a more populist discourse to an institutionalist one (following Laclau’s terminology) promising the reproduction of a stable, conflict-free field of differences within the frontiers instituted by prior populist moments. The “System of National Cooperation” is built on the notion that with the Fidesz landslide, “the long period of transition rife with struggles, divisiveness, and crises” has come to an end and given way to “national unity” – the nation, of course, as represented by Fidesz, which promptly proceeded to pack state organs with party personnel and dismantle checks and balances in a constitutional coup. The 2011 constitution, unilaterally drafted and ratified by Fidesz’s two-thirds parliamentary majority, enshrined an ethno-nationalist imaginary by holding the state responsible for the “one single Hungarian nation” as extending onto “the Hungarians living beyond its orders”. It is worth noting that the constitutional project itself followed an institutionalist logic of differential incorporation: the idea of a new constitution with the Holy Crown as state symbol was part of Jobbik’s 2010 election program, co-opted by Fidesz after the election from a position of power from its new main competitor on the right. 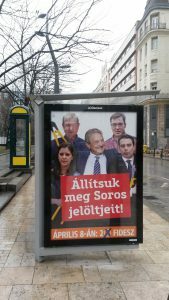 This populist moment can be seen in full flourish in the Fidesz government’s recent campaign against George Soros, who takes on the function of an external locus of power – a puppet-master who supposedly holds together an otherwise hopelessly fragmented opposition and existentially threatens the nation with a secret “plan” to relocate millions of immigrants to Hungary. In this discourse, the name of Soros becomes an empty signifier par excellence that ascribes to the opposition a positive cohesion – beyond just being against Fidesz – that otherwise (and in reality) is not there: one of the government posters seen frequently around the country features Soros shoulder-to-shoulder with the leaders of Jobbik, MSZP-Dialogue, the Greens (LMP), and the Democratic Coalition, with the caption “Together they dismantle the border closure”; in the last few weeks before the election, the same poster has been replaced by the Fidesz campaign with the caption “Let’s stop Soros’s candidates!” (see title photo) This points back to the key problem for the centrist and center-left opposition parties: the lack of coordination in single-member districts amid increasing calls for doing so (especially following the shock local by-election result in Hódmezővásárhely) – with the evil paymaster Soros supposedly standing behind any desperate last-ditch attempts to coordinate. This, then, is the latest hegemonic displacement in Fidesz’s discourse: the upcoming election will be about whether Hungary will become an “immigrant country” – replete with the worst nightmares from Western European cities – with Fidesz representing the sole opposition to the forces of Soros bent on making this happen. This can be read not least as an attempt to neutralize Jobbik, which, under Gábor Vona’s “people’s party” strategy, has pursued a counter-hegemony project from the right that seeks to dislocate the discourse of Fidesz by dismissing its enemy constructions as unreal threats diverting from its own mismanagement of the country (from opposing the Lex CEU to Vona’s insistence that the biggest problem in Hungary is emigration, not immigration). The centrist and center-left parties – despite Gergely Karácsony’s candidacy as head of the MSZP-Dialogue alliance and his forays into left-wing populist territory in opposing “the Fidesz elite” and calling for an “oligarch tax” – remain hampered to varying degrees by their pasts and, in the absence of actual coordination, may be left facing political oblivion in an ever more militant illiberal state. In the theory of Ernesto Laclau and Chantal Mouffe, all social reality is understood as discursively constituted through the production of differences, yet the differential identity of any discursive element (e.g. “liberty” or “justice”) resists definitive fixation and can be re-inscribed equivalentially around new oppositions (e.g. “the people” as all those who are exploited by the ruling class; “liberty” as the overcoming of one-party rule). Hegemony is this essentially political operation that (re-)defines the coordinates of the social by instituting a field of differences in antagonistic demarcation from something else and reproducing it in partially sedimented form (as the “natural” state of affairs), often in conjunction with (re-)invocations of an antagonistic Other(s) that reinforce the identity of the hegemonic bloc. Cited in Zsolt Enyedi, “Plebeians, Citoyens and Aristocrats or Where is the Bottom of Bottom-up? The Case of Hungary,” in Hanspeter Kriesi and Takis Pappas, eds, European Populism in the Shadow of the Great Recession (Colchester: ECPR Press, 2015), 237. Cited in József Debreczeni, Arcmás (Budapest: Noran-Libro Kiadó, 2009), 336. Dieser Eintrag wurde veröffentlicht in Allgemein, Defekte Demokratie, Demokratiequalität, Demokratietheorie, English posts, Parteien, Populismus, Populismus und verschlagwortet Autocracy, Discourse Analysis, Elections in Hungary, Hegemony Project, Populism von S Kim. Permanenter Link des Eintrags.